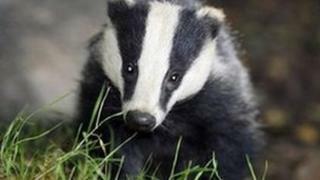 The High Court in Belfast has heard a badger was torn to shreds by dogs as a group of men cheered on the pit bulls. On Monday, a prosecution lawyer alleged in court that the attack on the badger came after it had been forced from its set and it was dazzled by a lamp before the dogs killed it inside just four minutes. He said dogs had been specifically bred for badger baiting and said domestic cats had been stolen to 'blood' the pit bulls and lurcher-type dogs. The lawyer said the video footage showed that men encouraged the dogs as they attacked badgers and cats, which were dragged out of cages. Police said they had encountered 'an element of hostility' as they carried out follow-up inquiries into the animal cruelty.